There are 307 million lakes in the world. With a number like that you're bound to be lakeside at some point of your life. Whether it's swimming, boating, or fishing, lake life offers a lot of options for leading an active lifestyle. Spending the days on the water offers health and wellness benefits in and of themselves, but activities on the water take those health benefits to the next level. Ready to try your hand at a new water sport in order to get in some quality sunshine and water time? Nothing says "lakeside" like fishing. 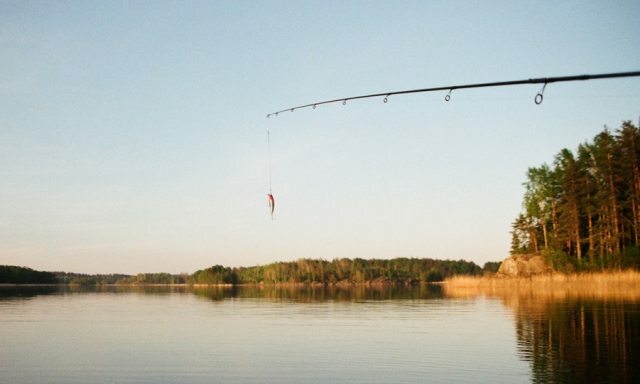 Check out this beginner's guide on how to fish. It'll give you the 411 on everything you need to know before you hit the water. Although the up-front cost of fishing is not crazy, it does take a small investment to get started. Cross items off this checklist to make sure you have everything you need before you head out to the lake. You can purchase a fishing license online. Most everything else can be purchased at a local sporting goods store. If it's a lakeside town, there's likely a bait and tackle shop you can check out for a local's help to get going. That local at the tackle shop just may become your new best friend. You'll need to do a little research to pick the right spot for fishing, and who would know better than a local fisherman? Find out if you need a boat or can fish from a dock. Then, make sure there is public access to any dock or shore from which you'd like to fish. Check with local authorities to understand the bag limits, or creel limits, at each lake. A bag limit is a specific criterion that needs to be met before you can keep the fish. Some lakes have a size (length and weight) minimum. Some lakes have a maximum take number. Double check on the weather before you head out the door. You will be out on the water. Bad weather can be extra bad from a boat. Don't risk your first fishing experience with bad weather. Once you reach your fishing spot, you'll need to do a little equipment prep. You'll need to attach a hook, weight, and bobber to your fishing line. First, attach the hook at the bottom of the line using an improved clinch knot. Then, attach at least one weight about six to twelve inches above your hook. Depending on the type of fish you are fishing for and how deep the lake is, you'll need to attach a bobber that will float your hook at a certain depth. Remember that the hotter it is outside, the deeper you'll need to fish to catch the same species. Use caution when tying on your fishing hook. The hook is barbed and will catch on your fingers fairly easily. On the end opposite from the barbed hook, there is a hook eye. Pass the fishing line through the hook eye. Take the loose end of the fishing line and make five turns around the standing end of the fishing line. Then, insert the loose end into the first loop made around the standing line. This will create a secondary loop. Pass the loose end back through the secondary loop. Tighten the knot slowly to make sure no part catches awkwardly. Try wetting the line to make the tightening go more smoothly. Ta-Da! An improved clinch knot! Casting is everything. It takes practice to perfect your cast, so don't be embarrassed by your casting technique off the bat. It will get better. Being able to consistently put your lure in the strike zone will increase your chance of a bite, and decrease your chance of a lost lure. You can purchase a cheap casting plug, which is a tool that helps you practice your cast. Find a secluded area, away from other people, and just keep casting until it feels natural. Regardless of the type of reel you have, the technique for casting is generally the same. Unlock the line and hold it with a finger so that the line doesn't pool at your feet on the shore. Then, swing your rod in an arc, releasing the finger holding the line when the line reaches the top of the arc. The hook should fly out over the water from the momentum and the heft of the weight. As the line sinks, lock the reel back in place so that the line doesn't keep unraveling. Leave the lake better than you found it. This means packing out all of your trash. Fishing line can be very harmful to birds and other wildlife. Make sure you clean up your fishing area, remove all the discarded fishing lines and lures. Practice conservation in the form of quick release. If the fish is too small to keep, try to quickly and safely return the fish to the water. Don't waste resources for the next angler to come along. Now that you have the basics of how to fish, get out on the water and enjoy the lake! Whether you catch anything is beside the point. Breathe in the fresh air and soak up some sun while learning a new hobby and experiencing nature. If fishing isn't for you, there are plenty of other water sports to try out. Check out this article outlining other seasonal hobbies to help keep you outside and active year-round.